The Moog app sits on my iPod touch, next to its analog predecessor Moogerfooger. Yeah, okay, I still like the knobs better, but it is fun, and the Moogerfooger doesn’t fit in my pocket unless I wear really silly-looking overalls. The application, Filtatron, hasn’t yet been announced. There’s no information on pricing or availability, accordingly. X/Y pads for tweaking and performance, plus preset sharing. You can actually use the app without any input, by transferring files from your computer or another application (with AudioCopy supprot). But connect a mic or line input (or use the internal mic on a device like the iPhone), and the Filtatron turns your device into a live filtering unit. So, what could this be used for? One of the Moog engineers imagined importing audio, processing on the go on the device, then re-importing to your music environment. (Just in case you want to adjust that LFO just right on the bus.) You can use it for real-time effects. Or you can even use it as a really unusual field recorder, recording only in Moogified sounds. I will say this: my impression so far is that it’s a lot of fun to use. Yes, there are other apps that do things like this. No, it isn’t nearly as satisfying to use as the Moogerfooger hardware – losing the tactile response really loses a lot. But it’s a different experience; something you could easily add to a chain of other devices or use on the go in a way you might not expect. 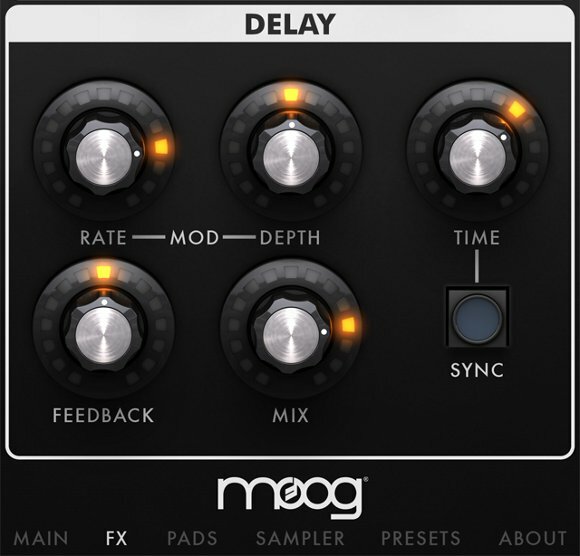 I also notice that, aside from getting Moog-like sounds, you really appreciate big, simplified controls. That says to me that software generally could learn a lot from hardware, not just in sound or tactile feel, but in design. Review forthcoming, but here’s the full run-down on specs. Audio input will work via any adapter. You can use the headphone/mic jack directly (though to get audio out, you’ll need to use a 3-prong minijack – more on that as I test my camcorder cable with this and other apps). You can also use third-party devices like the Blue Mikey (good if you need a mic) or IK Multimedia iRIG (good for mono instrument/guitar input). I’m also testing the iRIG. Filter: modeled 4-pole resonant filter, which Moog intended to be matched to their analog filters. Lowpass, highpass, cutoff, resonance, self-oscillation at high resonance – you know, the usual. LFO, Envelope Filter: Routed to filter cutoff. LFO: sine, ramp, sawtooth, square, sample&hold. Crossfade/morph between LFO shapes. Bipolar LFO (sweep up or down). Free-tuned LFOs, sync to tap tempo. Envelope Follower: Route sound inputs to sweep the filter, with adjustable reaction speed. Amp (overdrive) effect with feedback. Also can self-oscillate. Delay effect. Delay with its own LFO. Adjustable from a short flange to longer delays. VCF pad controls filter cutoff and resonance, LFO pad controls LFO Rate and Amount, Delay pad controls delay time and feedback. VCO pad controls oscillator frequency and level (amplitude) – if the VCO “Release” parameter is engaged (ENABLE button on VCO panel, main page), then the VCO x-y pad also controls the VCO volume gate — the VCO is silent when you are not touching the pad and sounds a note on each touch. ENV pad controls envelope follower amount and speed, and AMP pad controls amp drive and feedback. Sampler: Play included loops, record your own samples, or bring in your own loops using either the AudioCopy/AudioPaste API or an FTP connection. Sampler includes play controls, playback speed (-2x to +2x), and tap-and-drag controls for loop start and stop on the waveform. Record audio into the sampler dry, or record with effects for resampling capability. Recording is limited only by available storage, but playback is limited to 10MB each (ca. 2 minutes). Preset recall and storage. Includes a number of presets, allows you to save your own, and provides onboard email sharing of presets. The Minimoog XL for iOS. All 61 keys, so small you can’t hit them. Still monophonic. Seriously. I want to see it in the traditional April Fool’s announcement, you guys on North Carolina. Christopher Wolfe, developer of the superb Jasuto (modular for iOS and now Android), is evidently behind some of the implementation here, collaborating with the Moog design team. Great work, Christopher. So it’s sort of a meeting of Chris’ mobile development experience with Moog’s hardware and design experience, as I see it. Looping is not something you can do live; that’s not really the focus of the amp. But once samples are recorded, they’re fun to play with. 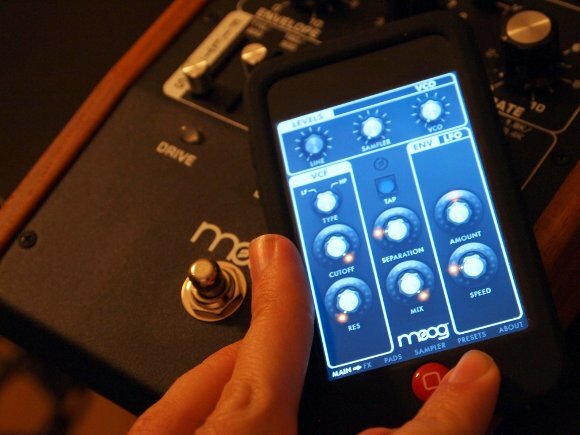 Oh, and for the record, I’m actually surprised there isn’t much controversy here regarding a Moog iPhone app. But shows that – like them or hate them – people have at least come to expect iOS music apps. 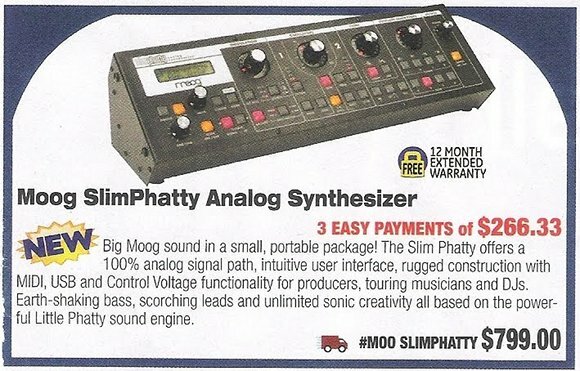 If you do love hardware, though, check out the Slim Phatty, a news story Matrixsynth broke yesterday with a leaked ad. (Thanks, sgnelson.) $799 for a rack mount-style module, leaving the question of choosing which keyboard to use to play it. $800 is a great deal on a Phatty; Dave Smith Instruments, of course, remain a strong (and incredibly affordable) choice in the same price range. Sing along, those of you who don’t like these iPhone apps moving in on the hardware. Y’all act like you never seen an iPhone app before. Moog to Release New iPhone, iPad app, “Filtatron”. Embrace it!